Are you headed to an amazing beach vacation? Beach vacations are meant to be ultimate moments of fun and immense serenity as you get to unravel the true beauty of our planet Earth in its raw form. However, if you wish to enjoy a beach vacation to its fullest, you need to plan in advance. There are several items that you cannot do without on a typical beach-side vacation. Sunscreen: Beaches are meant to be the ultimate natural sources of vitamin D. Though it might be essential for the well-being of your body in some extent, you must also take care of not over-exposing yourself to the intense beach sunlight. As such, a pack of sunscreen with a good SPF value must be your topmost priority while packing for your beach visit. Carry a good sunscreen with around SPF 50 or more to step out on the beaches confidently, without any annoying sun-tan lines. Flip Flops: You wouldn’t be strolling on a beach comfortably in some stylish pair of high heels or business shoes. All you need while on the soft beach sand is ultimate comfort while walking around. As such, a pair of comfortable flips flops becomes another essential must-have in your travel bag. Flip flops are highly lightweight and comfy while on a beach vacation. Moreover, these can also be rinsed off easily and re-packed in your bags while returning from the trip. Swim Wear: Beach vacations without proper swim wear or swimsuits are a complete fail. 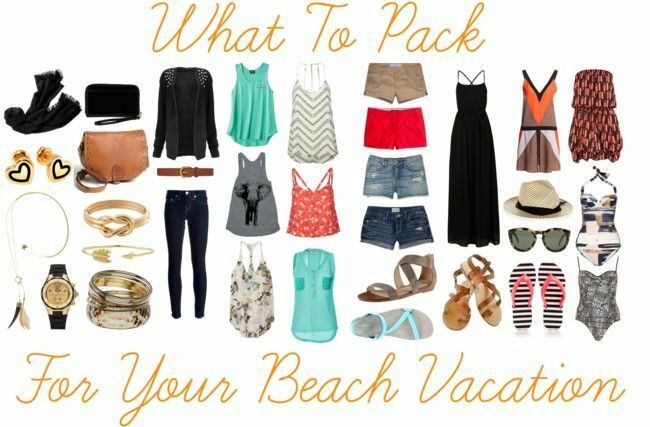 Take out your favorite swim wear and pack it straight into your travel luggage for an eventful beach trip. While buying or taking a swimsuit along with you on some vacation by the beach, you must ensure that the particular attire is comfortable enough. For the ladies out there, you can team your swimwear with some designer accessories to complete the look. Sunglasses: As sunscreens are for your skin, the sunglasses are for your eyes. Beach sunlight tends to be too intense on one’s body as well as on the eyes. To prevent your delicate eyes from the bright glare and harmful sun’s UV rays, you must pack your favorite sun glares with you too. You can protect your eyes and look equally stylish at the same time by adorning a classic pair of sunglasses on your vacation. Beach Bag: When you are headed out to the sprawling beach, you might need to carry a lot of important stuff including sunglasses, sunscreens, flip flops, novels, snacks, and much more. As such, you cannot do without a spacious, comfortable beach bag on your side. Pack a reasonably-sized beach bag with yourself to carry it out to the beach as you get to enjoy the scene without any worries of your belongings. First Aid Kit: This is another essential item that must be kept at your service while you are on a beach vacation. You must ensure carrying some important medicines, balls of cotton, some antiseptics, bandages, and other stuff while on a beach to remain safe in case of any incident. Have the best beach trip of your life by following this beach-essential checklist! Tent Camping – Jaisalmer Offers All Of The Nature’s Delight!